NEW HAVEN — The night Yale lost to Harvard in the Ivy League men’s basketball playoff is still devastating to him. The internal metronome in the Whiffenpoofs’ unforgiving world tour somehow gave Brandon Sherrod enough of a beat to take a break from globe-trotting and watch his Bulldogs play one game to determine their NCAA fate. But he wasn’t in Philadelphia last March with his team. Instead, he was in Fort Lauderdale with the Poofs, Yale’s historic all-male a cappella group, about to start a long run of performance dates. The best he could do was watch on television at a bar. Sherrod knew when he made the decision to take a year off school for a once-in-a-lifetime opportunity to sing with the Whiffenpoofs that it could mean missing out on making history with the basketball team. The Bulldogs hadn’t been to the NCAA Tournament since 1962, and Sherrod was supposed to be part of a team with the talent, experience, and chemistry to change that in 2014-15. But when Harvard walked off the floor with a 53-51 win in the one-game playoff, Yale was kept in waiting, and Sherrod had more than 100 Whiffenpoof performances to think about. Still, after seizing the opportunity off the court, he realized he still had a chance to go after the one he left on it. “Once that happened, it was like, click, make sure you’re ready,” Sherrod said. Wherever the Whiffenpoofs took him — from Hawaii to D.C., Ecuador to Peru, France to Germany, Iceland to Greece, Cambodia to Thailand — he found a gym, found a court, found a pickup game. In Germany, he played every day. “It was just play, eat, go out, come back, wake up, repeat,” he said. He got back to campus a week after the world tour ended last August. “So I didn’t really get a chance to absorb everything that had just happened,” he said. 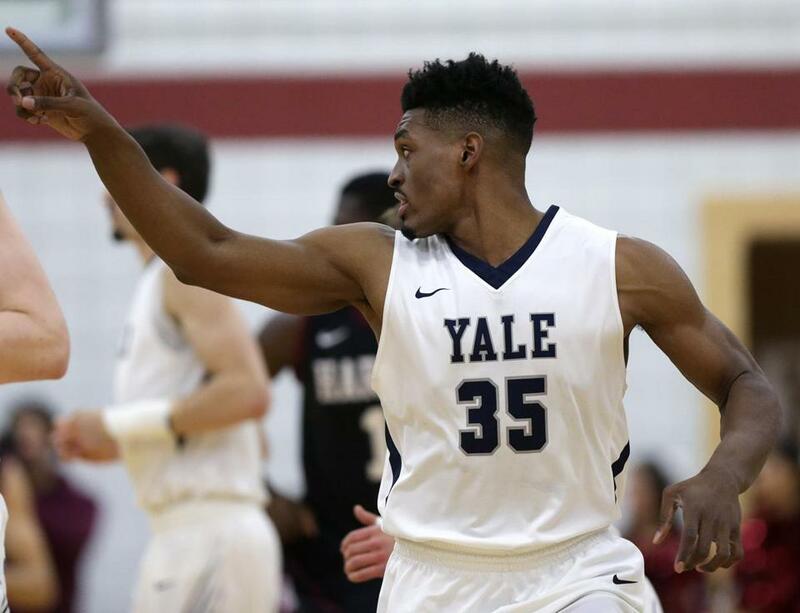 Forward Brandon Sherrod is averaging 12.2 points and 7.0 rebounds for a Yale team that is 20-6 overall and leading the Ivy League at 11-1. As much as Yale coach James Jones missed Sherrod last season, he knew what he had coming back to the team: a player that gives the Bulldogs the inside scoring and rebounding that makes them the most imposing team in the Ivy League in the paint, a player with the consistency to set an NCAA record for consecutive field goals, and a player that teammates respect. “I would suspect that there are several coaches in the league that wish he would’ve graduated last year,” Jones joked. Now, with the Bulldogs (20-6, 11-1) sitting atop the Ivy League going into the final week of the regular season, with a chance to finally punch their NCAA ticket, Sherrod can look back and say it was worth it. The hardest part wasn’t explaining what a Whiffenpoof was. The group has been around for more than a century and is as ingrained in Yale history as Handsome Dan, the bulldog mascot. What tied Sherrod’s nerves in knots two years ago was having to walk into Jones’s office and tell him that he was stepping out on a limb to be a part of that history — and that it would mean taking a season away from basketball. After an audition in front of 14 previous Poofs that consisted of 15 minutes of pitch-matching, blending exercises, sight-reading, solos, and range tests, Sherrod had impressed. What he didn’t realize was that the news had already gotten to Jones. Then Sherrod told Jones that singing with the group would mean a one-year commitment to perform 250 shows on every continent except Antarctica. Sherrod would be able to travel the world and explore a talent he had had since childhood. It also would mean sacrificing basketball. But there was some fear that Jones would be upset if he did. Yale had possibly its best team in years. An NCAA berth was within their grasp, and Sherrod was very much a part of the plan Jones had laid out. “I’d be lying to you if I said I didn’t think about the team at that time,” Jones said. But he also thought about what he told Sherrod when he recruited him to Yale. “We talked about all these nooks and crannies that Yale had to offer when he was being recruited,” said Jones, “and I would be a hypocrite to do anything other than support him through an opportunity that was once-in-a-lifetime for him. “I certainly knew that he had a lot on his mind before he came here. That’s one of the reasons why he chose Yale, because it was a great combination for him to go to school here and to run with his thoughts and what his goals were in life. The music was playing in Sherrod’s head even when he was a baby with just pots and pans to bang on. His mother was the praise and worship leader at church, and he grew up hearing her melodies waft through the house. Eventually, he joined the church choir, and that’s where he developed his ear. He learned to drum by watching older drummers in the church. By the fourth grade, he picked up the saxophone. He learned to play piano by watching the music minister, Sam Denny. The only music in the house was gospel. His soundtrack was Kirk Franklin, Fred Hammond, Tye Tribbett, and James Cleveland. As he got older, his friends opened him up to neo soul voices such as D’Angelo, the Foreign Exchange, and A Tribe Called Quest. In his junior year of high school, he started an a cappella group with four classmates and would arrange three-part harmonies. He would sing the bottom. But his family — mother Sandy and younger sisters Chelsea, Chayla, and Chynna — was the choir he was born into. “My siblings aren’t together very often, but when we are, it’s almost an immediate harmonization happening,” said Chynna. “We’ll be in the car together, we’ll turn the radio on, and immediately out of force of habit we just start singing together. Brandon was the first to sing. He taught Chynna how to harmonize. “A lot of the musical tricks that I do and a lot of runs or riffs that I do are all inspired by him and the things I’ve watched or heard him do,” Chynna said. When he told her he was taking the leap to the Whiffenpoofs, she didn’t hesitate. When “American Idol” announced its farewell season earlier this year, Chynna toyed with the idea of auditioning for the show. She asked her brother what he thought. She went to Philadelphia, sang Ariana Grande’s “One Last Time,” wowed judges Jennifer Lopez, Harry Connick Jr., and Keith Urban, and earned a ticket to Hollywood. Back when Sherrod was in prep school at Choate Rosemary Hall in Wallingford, Conn., his coach, Adam Finkelstein, would kid him. “I used to joke with him and say he was a better singer than he was a basketball player,” Finkelstein said. Sherrod was the centerpiece of a team that went 27-0 in 2010. He was the New Haven Register’s Player of the Year. Finkelstein could pencil him in for 16 points, 14 rebounds, and 6 blocks a night. But there was a seed of truth in the joke. Finkelstein knew as much when he first took Sherrod on a tour of Choate. The school’s elite legacy spoke for itself since the days when John F. Kennedy ran the campus with the Muckers. Finkelstein could drown Sherrod with that much history, so he kept something in his back pocket. He had plenty of alumni names to drop, too: Jamie Lee Curtis, Michael Douglas, Glenn Close, Paul Giamatti. When Sherrod got to Choate, he explored all of his interests. When he wasn’t on the basketball court, he was in an a cappella group. When he wasn’t in the playbook, he was into politics. “He’s just a multitalented kid,” Finkelstein said. When it came time to make a decision about college, Sherrod had his pick of Ivy League schools. He settled on Yale, but the night before he was to make it official, he got cold feet. “His best friend called me and said, ‘I’m not sure if Brandon is going to go to Yale,’ ” Finkelstein said. Finkelstein lived 30 minutes from campus and had driven all the way home when he got the call. He immediately turned the car around. “He and I sat in the empty cafeteria for a long time and I asked him two questions,” Finkelstein remembered. When the conversation was over, Finkelstein still wasn’t sure what Sherrod was going to do. But years later, when he heard that Sherrod was taking a year off from basketball to join the Poofs, he wasn’t the least bit surprised. Jones was able to see for himself last May when the Poofs performed at the Smilow Cancer Hospital in New Haven. Sherrod sang a solo. But Sherrod came into the season feeling strong and refreshed. He is Yale’s third-leading scorer (12.2 points per game) and rebounder (7.0), but for a stretch of games starting in late January, he found himself in basketball nirvana. A perfect 9-for-9 shooting night against Brown was the start of a streak of 30 straight made field goals that set an NCAA Division 1 record. Initially, Sherrod said, he didn’t realize what was happening. The next weekend, he went 7 for 7 against Penn, then 8 for 8 against Princeton. For the week going into the Columbia game, all he heard was that he hadn’t missed a shot in three games. He needed two more field goals to tie the record. He got a dunk to tie the record, then he got an easy layup to break it. Sherrod took it as another sign of how charmed things have been for him.